Mathew Campbell has played percussion since the age of 8. He started playing drum set, then he started to learn concert percussion in sixth grade. He won many awards through middle school and high school at the regional and state levels. 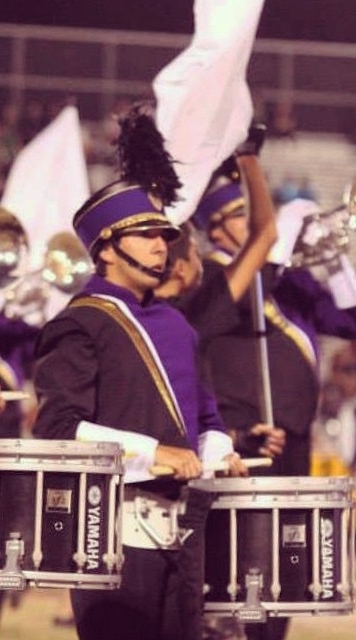 Mathew has marched in marching band and indoor marching percussion ensembles. He has also performed in concert band, orchestra, and chamber ensembles. He also has performed solos at the regional level at recitals and concerts. He has performed at the Percussive Arts Society International Convention as a member of the Rio Bravo Bass Ensemble in the 2015 Percussive Arts Society Marching Festival. Mathew was a member of the Rio Bravo Percussion Ensemble under the direction of Dr. Joe Moore III during his undergraduate studies. He was most-recently a member of the Oklahoma City University Percussion Ensemble in his graduate studies. Mathew has also performed with jazz bands, rock bands, and worship bands. He was the percussionist for L'acoustica, a jazz quartet along with Rio Grande Jazz in Brownsville, Texas. He and his band have performed across South Texas including South Padre Island. His passion for drumming landed him in the rhythm section for the UT - Rio Grande Valley Jazz Orchestra under the direction of Albert Lo. More recently, Mathew has performed with ensembles in the Oklahoma City Metropolitan Area. Other notable percussion teachers of Mathew are Dr. Tom Nevill, Mr. David Lopez, Dr. Mark Eichenberger, Dr. David Steffens, and Prof. Patrick Womack. Mathew has been an active member of the Percussive Arts Society since 2015. Mathew is a founding member of The Uptown Collective - a modular ensemble with Clarinet, Cello, and two Percussionists as primary players.